I am SO excited to share this look! I found this skirt while shopping around in New York last month, and fell head over heels in love with it. The fabric is so soft and fluid – it flows and moves so gracefully! In addition to this gorgeous silver hue, it comes in four other colors as well. Obsessed! I actually wore this look yesterday to church with a different set of accessories and a pretty coat – see and shop that look here! If you don’t need to buy a new skirt, this is definitely an outfit you can recreate if you already own a pleated skirt and sweater. 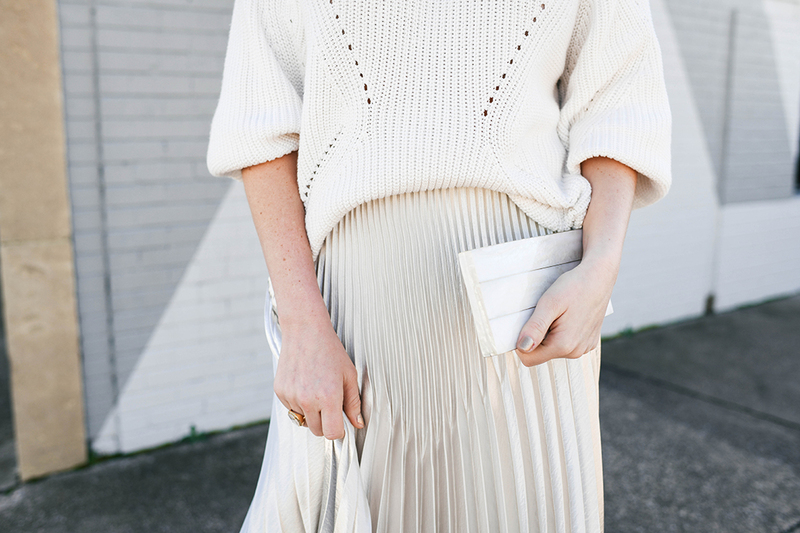 I love the muted winter white + silver combo, but this look would work in any color scheme! If your skirt isn’t metallic, it is also a great outfit idea for the office. Comfortable, sophisticated, and still on-trend. I went with a slouchy sweater because I liked the way it dressed down the skirt and added a cozy element to the overall look, but you could also try a more fitted piece a la Meghan Markle! While this skirt could definitely be considered “holiday” I plan on wearing it well into spring and summer. 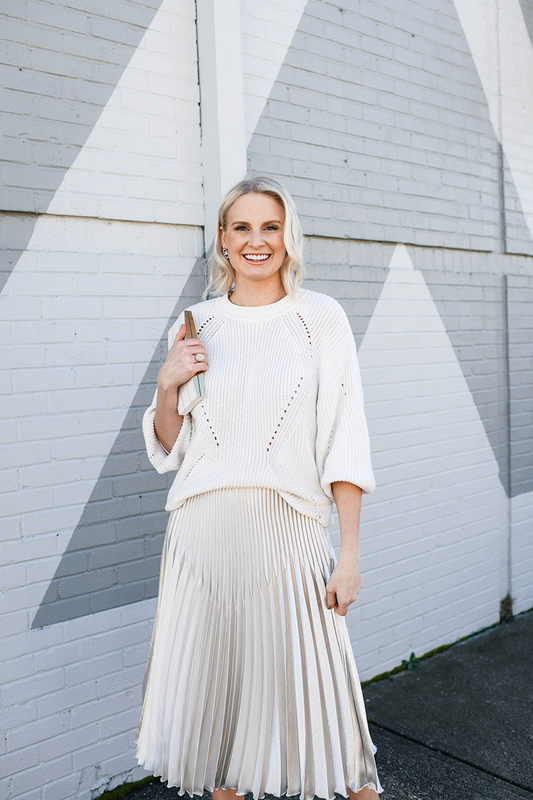 There are so many other similar skirts available right now in a bevvy of neutral and spring hues – below are some of my favorites! This metallic pleated skirt is under $140 and in a beautiful minty hue. Such a fun piece for the spring season! How stunning is this white lace pleated skirt? Angelic. Don’t miss this pastel colorblock style or this lace-hem style by the same label! All three are pleated and gorgeous. I can’t believe this skirt is on sale for only $19!! It comes in baby blue, lilac, hot pink and soft yellow. So fun! A good pull-on style to pair with tees on vacay. This pale pink midi skirt is super flowy and pretty! Also on sale. This gold pleated skirt is another fun party piece you can easily dress down! Looking for color? Don’t miss this, this and this… all on sale. This skirt is VERY similar to mine, but quite a bit more expensive (even on sale!)! This skirt is so pretty indeed, gorgeous outfit. Where is the top from? Whole look is perfect! Hi Andrea! The sweater is HM, but it’s from last year… sorry girl!